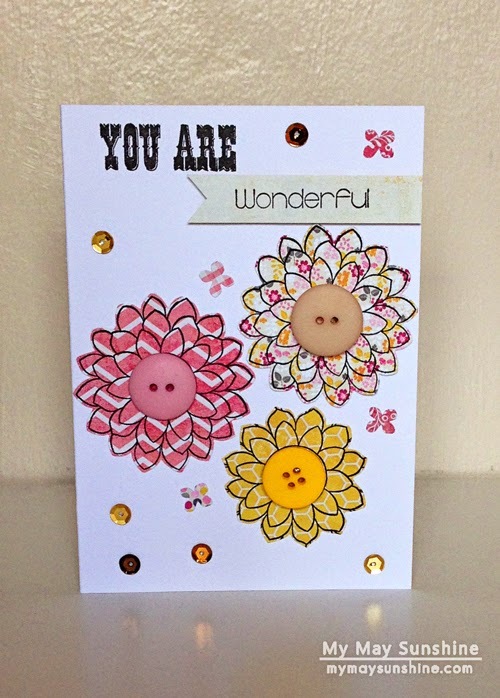 For today’s card, I wanted to make a card with the You Are stamp set from Clearly Besotted. I thought the stamp that had the outline of the flower would be good to use on some patterned paper. I chose the paper from Recollections The Sweetest Thing as I love the colours in this pack. I stamped two large flowers and then stamped a third but cut it out to be a smaller flower. I used the sentiment that came with the stamp set and chose the “wonderful” stamp to go with the “you are”. Keeping the background plain, I added some small punched hydrangeas and some sequins. To embellish the flowers more, I added a button to the centre. Paper – Recollections The Sweetest Thing | Stamp – Clearly Besotted You Are | Sequins – Doodlebug | Small flower – Martha Stewart Hydrangea punch | Tag – Clearly Besotted Tag Along Die | Buttons – American Craft and Sew Sweet. Although the background is plain, there is a lot going on with the colours and patterns to bring the card together. Hope you have a lovely day. See you soon.